Nice to meet you all! Let me just explain my short story. I played the violin in middle school and progressed really well. I believe I was 1st chair and soloist. My last year in middle school, I had told my teacher I wasn't going to continue but instead take up tennis in high school. She had been pretty upset and tried to talk me into continuing the violin. Unfortunately, I did as I told her and I stopped the violin and took up tennis. Over the years, I have found myself regretting this as I've missed the violin. For one reason or another, I never took it up again.. Until now.. I was able to become friends with a man that works with my husband. It turns out he is retired but works for something to do. He is also a professional violinist and was in a band that traveled a lot and did a lot of playing with his daughter. He used to give classes on the violin and just did a lot of great things. After his wife died a few years ago, he stopped playing. He just lost the motivation to keep up with it all. He found out that I was wanting to take up the violin again and let me come to his house. 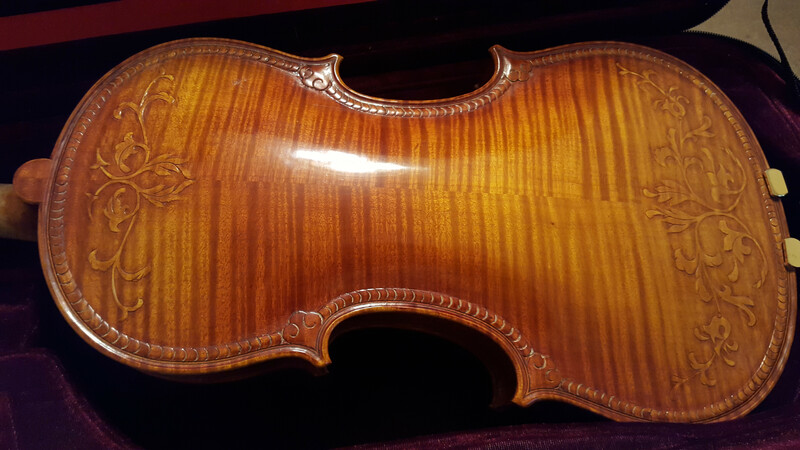 I got to look at all of his violins (I think he had 5-6), including one that was made in 1906! He told me to pick whatever violin I wanted to buy from him and then pick a case as well. It's very nice to meet you all.. I am looking forward to talking with you all and relearning everything I left behind in school. 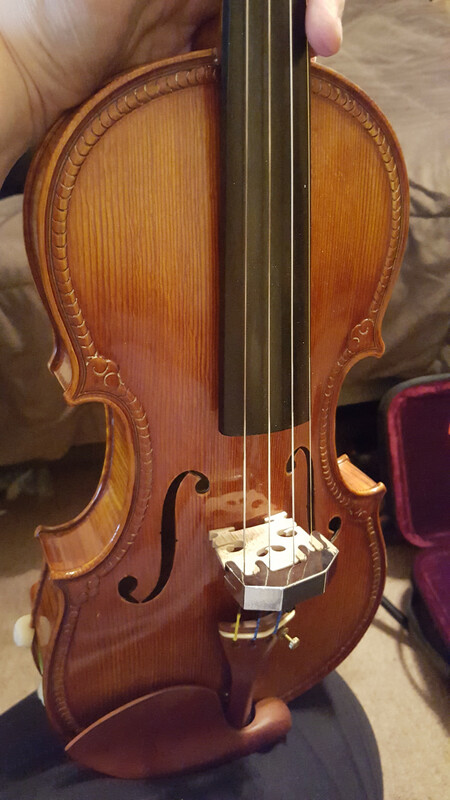 It's such a beautiful instrument and I'm so happy to take it up again! You'll never know unless you try! 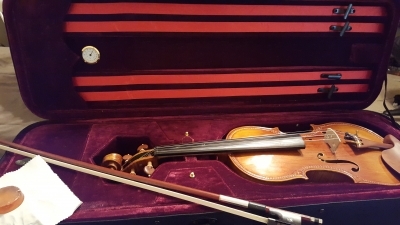 What's in my violin case? Welcome @StaceyC - great story - I hope your return to playing helps to remove the "regret" you have experienced! I'm certain it will All the best ! **EDIT** ( LOL, we all do it ! ) - meant to say I love the detail on the violin - wonderful ! Fran, since you recently started it up again and after a longer period of time than me, how are you doing with it now? How much do you practice on average? @StaceyC I actually started taking private lessons in January 2017 cause I felt I wasn't really getting anywhere by myself without direction. And I'm learning 3rd position which I never did in the past too! I'm practicing 1.5 to 2 hours daily with few exceptions. I really love it and am so glad I've taken it up again! Great story, & that's beautiful violin. I'm sure you'll pick it back up quicker than you realize & you'll find people here are absolutely great at helping with any questions you may have. The videos Pierre has posted are a TREMENDOUS help & there are some great tools to utilize here as well (metronome, drones, timing/intonation games, etc). "I know that the most joy in my life has come to me from my violin." Nice to meet you too Stayey. We are very happy to have you here on our forum and look forward to hearing more from you. Beautiful instrument you got there. Hello and how nice to meet you. I am in agreement...that violin is so exquisite. Cheers, and Happy to meet you. One of the many benefits of the internet. There are so many great "tools" out there for learning anything! Back when I was in school, the internet was just in its infancy stages.. Sure we had it and could do things on the internet, but it is no where near what it is today. We have the benefit of finding great forums such as this and of course there's YouTube. 🙂 I am so glad that I came across Fiddlerman's YouTube channel!! I'm glad you came across my channel too. Traffic has been dying on Fiddlerman.com for a couple of years but I hope to be able to devote time to making it more special. Thanks to all you loyal members. I think you see the '5 years ago' beginners moving on to more advanced training and fewer new comers learning. I think it could be a seasonable thing as well... seldom do young players prefer to stay inside and play when their friends are headed to the lake for a BBQ. It is still "home" I will always come here and be a part of this vibrant community. I think the ease of Facebook and groups had dimmed the light in true forum style communities. The site is wonderful and I hope it lives on and on. I know when you are around things are more lively. You are the glue, and the person who set an example for us all to grow and help each other. The "old" souls here I encourage you to stay around. We move on from all the gleaning information and we take are part to help others and they like to hear the "old timers" and they like to be included.